Longwood is a rural township and district in northern Victoria, between Seymour and Benalla. It is 35 km north-east of Seymour and 120 km from Melbourne. Longwood’s name is thought to have come from the island of St Helena. The island’s lieutenant governor had been accommodated in a house called Longwood, and the house became the place where Napoleon was kept when he was exiled to the island. A settler planted two willow cuttings reputedly taken from Longwood, St Helena, and when the site for Longwood was surveyed in the 1860s the name was adopted. 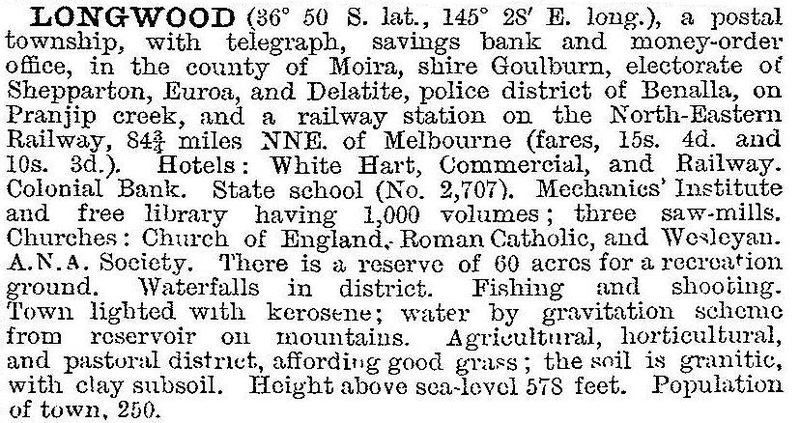 Longwood was a junction for coach services which branched from the Melbourne to Sydney road to several mining townships, Mansfield, Gobur, Alexandra and Woods Point. In 1872 the railway line was extended from Seymour to Longwood, resulting in the growth of a new township at the railway station. ‘Old Longwood’ on the highway is marked by the cemetery, 2 km south of the railway line. A school was opened in 1861 at Longwood East, now Old Longwood. The development of Longwood itself occurred in the 1880s. An early building was the mechanics’ institute (1884) serving as a venue for the school and the Anglican church until they obtained their own buildings. A Catholic church began in 1885 and a Methodist church in 1886. In 1897 a detachment of the Victorian Mounted Rifles was raised in Longwood. Lieutenant Maygar von a Victoria Cross in the South African war (1901) and Major Frederick Tubb won a Victoria Cross at Lone Pine, Gallipoli (1915). Two Military Crosses were also won by Longwood soldiers in World War I. The Boer War memorial is in Down Street. Longwood is bypassed by the Hume Freeway. Fauna bridges have been put in place to help animals including squirrel gliders cross the freeway above the roadway. Longwood has a school (17 pupils, 2014), a large recreation area with an oval and tennis courts, a hotel and two churches. The ranges to the south are lightly timbered, and the northern farmlands are mostly used for grazing. The district has been affected by bushfires, with a severe outbreak in 1965 causing the loss of seven lives. The mechanics’ institute hall was demolished in 1982. Other localities near Longwood include Locksley (on the railway line to the south-west) and Ruffy, 20 km to the south. Ruffy has a school, a hall and two churches, and at one time had a racecourse like Longwood.